People tend to think oatmeal is a lot of trouble, but it can be made in big batches. Simply store your cooked oatmeal in the fridge and in the morning, scoop a serving into a bowl, top with milk, and heat it in the microwave. Even better, you can add your favorite toppings on the day you make the big batch, thus saving even more time in the morning. I prefer steel-cut oatmeal. Fresh or frozen blueberries, raspberries or blackberries. If you add them while the oatmeal is still hot, they’ll steam and cook a little, which helps them last longer. Walnuts, pecans, ground almonds. Sometimes I even use pistachios! Put the oats, water and dash of salt into a heavy pot. Cover and bring to a boil. Once the water boils, turn down the heat and simmer for about 40-60 minutes. Sometimes I just turn off the heat after about 20 minutes, keep the pot covered, and let the pot sit until all the water has been absorbed. Most women know they’re supposed to get a LOT of calcium. The National Institute of Health recommends 1000 mgs of calcium per day. That translates into over three glasses of milk per day, or two and a half cups of yogurt, or four and a half cups of broccoli. The trouble is, that is way more than I am inclined to eat in a day, even if I were to have a combination of milk, yogurt, and broccoli servings over the course of a few meals. Personally, I haven’t found a calcium supplement I like. They’re too sugary, they leave a bad taste in my mouth. I’d rather eat real food. Therefore, I have invented a molasses latte. One tablespoon of blackstrap molasses contains 137 mg of calcium. If you combine that with milk, and other natural calcium sources throughout the day, you’ll get closer to that daily recommended amount. And given the average size of a latte today, you might even have two small, home-made ones, or perhaps you’re lucky enough to have a double-sized cup at home in which you can make a “tall” or “large” sized latte for yourself. Pour the milk into your coffee mug and warm it in the microwave. Top it off with fresh, hot coffee. Stir in the molasses. Add a pinch of ginger. I tried a new food today; kohlrabi. It was amazing. First, I sliced a tray full and roasted thin slices of kohlrabi in olive oil. But I still had a lot left. So then I made a cream of kohlrabi soup. Amazing. Two things led up to this adventure. The first is that I enrolled in a college nutrition course. This is THE best investment I have ever made in my health. After twenty-plus years of blank stares from doctors when I was first struggling with the symptoms of gluten sensitivity, not knowing the cause, and then another five years of blank stares after letting doctors know that I can’t handle gluten, I have made life-changing breakthroughs that solve a lot of mysteries. Vitamin A for eyes? You need to eat things like carrots and butternut or acorn squash with a little fat, or else your body can’t absorb it. Noticed your eyesight deteriorating lately? You might want to try having a few extra carrots w/ olive-oil based salad dressing, or squash with a pat of butter on top. One key variable I learned about is that if your body isn’t handling gluten, then the mechanisms that absorb all the other nutrients are essentially blocked, shut down, wilted, rendered useless with regard to absorbing other nutrients. Had a few bloody noses lately? When you get a paper cut do you spout like a fountain? Vitamin K is essential to helping blood clot. It’s so essential that newborns get a shot of vitamin K right away when they’re born. If they didn’t get it, and got a minor cut, they could bleed to death. Go ahead, check it out. That’s what my college nutrition book says, and I believe it. Why? Because unstoppable flowing blood has been around in my world for quite a while. None of these things ever get connected when I talk to doctors. If there’s anything I’ve learned, it’s to be your own detective, and take charge of your own health. So kohlrabi. 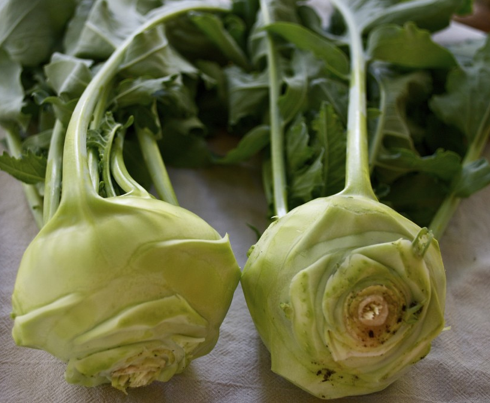 The other motive behind kohlrabi is that I hear Lynn Rosetto Casper recommend it on a radio show this week. She gave some tips on how to use it: mashed with butter like potatoes, roasted, or in a cream based soup. Finally, in my nutrition class, I learned that variety is key. I’m inclined to fall into ruts. I’ll eat the same thing everyday for months before I get sick of it. But my nutrition class encourages variety. Not just seasonally, but daily, too. So I’ve started branching out. I’ve started taking risks. I’ve started bringing home one new fruit or vegetable from the store each week. Since I’ve begun, I’ve discovered blackstrap molasses for calcium, cocoa nibs for antioxidants, increased my fish and flaxseed for omega-3s, and gone on a few adventures. Saute the onion and celery for a few minutes. Add the kohlrabi chunks. Cover and cook for about 5 minutes. Add the broth and stir well to mix the broth with the butter/corn starch mixture. Cover and heat until boiling. Turn down the heat and simmer for about 25 minutes. Remove from heat and blend with an immersion blender, or in a regular blender. Please be careful with the hot liquids! You can let the soup cool a bit. It won’t hurt. Taste for seasonings. Maybe top with a little freshly ground pepper. Garnish with chopped green onion or parsely, if you like. Hint: When you bring home fresh herbs, green onion or bunches of parsley, chop it all up right away and store it in a covered container in the fridge. It’s SO handy for adding to eggs, sauces, pizza, salad, you name it. Just do it. You’ll be glad. *Butter — a lot of chefs will say that when making a milk based dish, butter enhances the flavor better than other options like olive oil. Suit yourself, but butter is making a comeback. It’s also a source of Vitamin D. Finally, stop and consider whether you feel full and more satisfied (thus eating less) when you eat something with a little normal, natural fat in it. I know I do. More than anything, I wanted a creative outlet today. One of my favorite things is to find a recipe for something I’ve never made before, get all the ingredients, then see how it turns out. 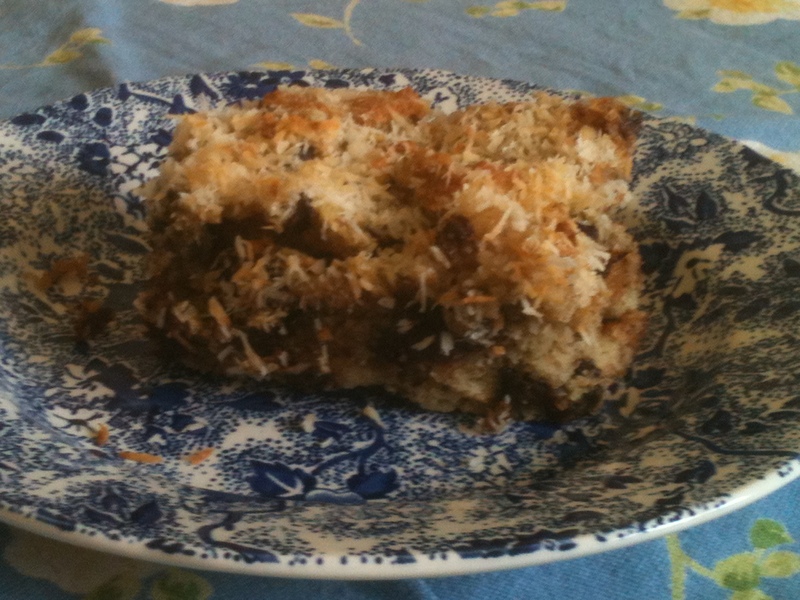 Today’s new recipe is adapted from one of my favorite gluten free blogs, Elana’s Pantry. One thing I like about gluten free baked goods is that there’s usually a lot of protein in the mix. That means I’m full after one or two bites! An indulgence I can’t go overboard on because a few bites is all I want and need. Note: this bar is not as sweet as a traditional cookie or candy bar. Feel free to add an extra teaspoon or two of sugar if you have a sweet tooth. I fell in love with the San Francisco Chronicle’s cookbooks while visiting San Francisco nearly a decade ago. This recipe is from their 1997 edition with the yellow cover. In contrast with most of the recipes I post, this requires a bit of ded ication. It’s not that it’s particularly tricky. It’s more that there are a lot of steps, and you need a good, solid day to make it. Fortunately, it’s a great diversion on a snowy day, and the reward of a steaming bowl when the day is done makes it worth while. It’s also a great recipe to make in big batches to keep in the freezer. In fact, I was thrilled to present a container as a gift to a friend last week. I simply grabbed one of the containers I’d kept in the freezer and off I went! And for those of you with workplace chili contests, this is absolutely a contender. Whether it brings home a blue ribbon or not, you’ll be proud it was in the running, and your co-workers will thank you, too. The ingredients that make this so special, in my mind, are the tomatillos, roasted Anaheim chiles, beer and rice vinegar. The rest are pretty common among chili recipes.. but with these additions the recipe turns from simple comfort food to gourmet fare. To make the chili, While the beans are cooking, place the beer in a 4-quart pot. Add the onions, garlic, bell pepper, jalapenos, green chiles, oregano and cumin. Simmer for 10 minutes. Place the tomatillos, minced cilantro, vinegar and salt in a food processor and process to a salsa consistency. Stir into the chili. 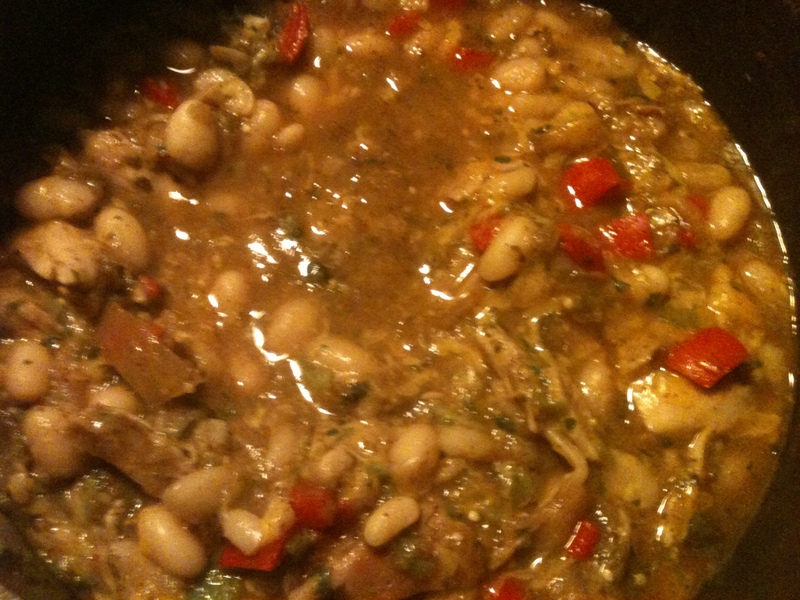 Add the drained cooked beans and simmer for 20 minutes. Taste for seasoning: add salt, if desired. Either sprinkle the cheese over the top of each bowl, or mix into the pot of chile until melted and blended. Garnish with cilantro. *To handle the jalapeno chiles, use a small ziplock baggie as a glove to keep the hot oils off your skin. Otherwise, you can burn your fingers, and if your finger ends up near your eye, you could burn your eye. **To roast and peel the Anaheim chiles, place on a cookie sheet under the broiler for about ten minutes per side. You may want to put a layer of aluminum foil on the sheet first, to help with cleanup. Once the chiles are blackened on each side (yes, really go for black), carefully remove from the oven and drop into a large ziplock bag. Seal the bag and let them sit for about five minutes. This steams the chiles and makes it easier to peel off the skin. Once the seeds and skins have been removed, dice and add to the chile. ***Spice flavorings are amplified and enriched by toasting briefly before adding to a recipe. Simply place a dry skillet (no oil) onto a lightly warmed burner. Measure your spices and sprinkle over the skillet. Allow to warm briefly without burning, just a minute or so depending on the heat of the skillet. Add to your recipe immediately. I am indebted to Elana Amsterdam, whose blog, Elana’s Pantry, has become my go-to source for easy, satisfying gluten-free recipes. First of all, her recipes’ ingredient lists are usually short and simple. Whereas the typical gluten-free baked goods recipe from other sources requires multiple types of flour and expensive xanthan gum, Elana’s come out beautifully with usually one type of flour (often coconut or almond), mixed with a few eggs, shortening and natural sweeteners like honey or agave syrup. It’s been the coldest week of the year in my wintry city. 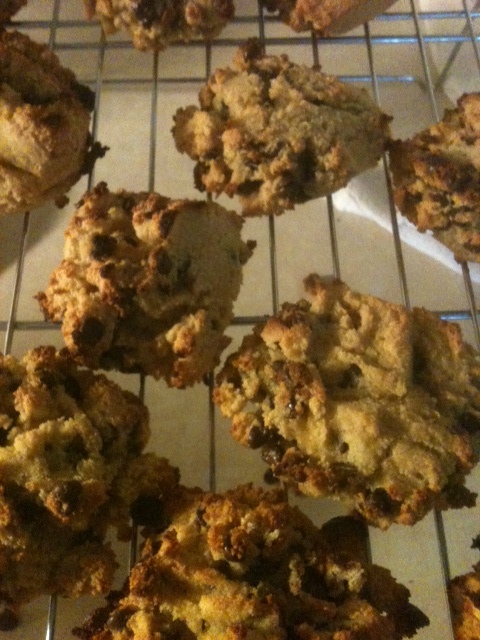 In need of a baked good for a potluck tomorrow, I pondered between two of Elana’s recipes. One was an almond-flour slightly sweet drop biscuit, the other was the recipe below for chocolate chip scones of coconut flour. Luckily, I had both types of flours on hand and had the luxury of deliberating. Since I hadn’t had a chance to try the chocolate chip scones yet, I succumbed to curiosity knowing that in case I didn’t like the way they turned out, I’d have a back up. Luckily, they were delicious and I am certain my potluck crew will love them! So easy that making a second batch was no trouble at all. Note: The instructions reflect how I made these, which is slightly different than the instructions on Elana’s site. After a June of cold rain and a July of sweltering humidity, we’ve finally got those ideal days of blue skies that are warm enough for shorts, but make you reach for long sleeves at night. With great delight, I am pushing aside summer salads and grilling. I am ready to be gently re-acquainted with my oven. This recipe is one of my absolute favorites. Filling, cheesy, high energy, and good if you’re craving something with a salty flavor, this is easy to whip up. Enjoy with warm tortillas, tortilla chips or as a side to any dinner. It also packs well, and is a great bring-your-own lunch. Nutrients: Red lentils are reported to contain fiber, folate, magnesium and iron. Dissolve the bouillon cube in 3 1/2 cups boiling water. Stir well. Add the lentils. Bring to a boil again, then reduce the heat and let simmer for 15-20 minutes, adding more water if necessary, until all the liquid is absorbed and the lentils are soft. Meanwhile, heat the soy sauce and 1/4 cup water in a saute’ pan. Add the onions, celery, and garlic and saute’ for 8-10 minutes, or until soft. Add the lentils and the tomato paste to the pan. Heat, stirring, until piping hot. Transfer to a baking dish and sprinkle with the cheese. Heat under a hot broiler for about 2 minutes, until the cheese begins to melt. Serve immediately.